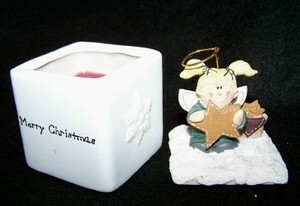 An angel topper on this cold cast ceramic candle crock has a snowflake on 3 sides with a "Merry Christmas" greeting on the other side. The candle inside is cinnamon scented. It has 4.6 oz of wax and burns approximately 15 hours. 2- 1/4" square x 5" high.